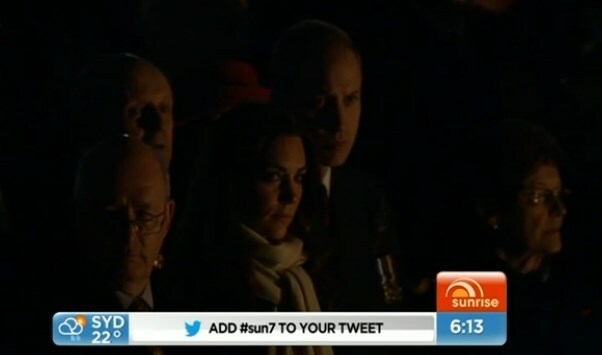 The Duke and Duchess of Cambridge made an unexpected appearance at the dawn service at Canberra's War Memorial. Prince William's name was on the Order of the Service, but not Kate's. Perhaps it was planned William would attend alone - depending on George's routine? The royal couple were part of a ceremony which is regarded as a sacred commemoration in Australia and New Zealand, when fallen soldiers are remembered and veteran soldiers march down the streets to cheering crowds. It is Australia's most significant anniversary, ANZAC Day. Later this morning, Their Royal Highnesses will witness a classic Anzac Day March, led this year by veterans of most recent conflicts and peacekeeping efforts including the Gulf War, East Timor, Iraq and Afghanistan. It's an important day for reflection: "Never forgetting those who have paid the ultimate sacrifice for our freedom." Just yesterday I had been discussing the lack of Alice Temperley pieces on this tour. The designer is normally a go-to for Kate yet her tour wardrobe didn't appear to include any of her designs - until this morning that is. Kate selected her Temperley London 'Noa' Coat for the service. The elegant piece features a jacquard diamond check design and a pleated hem. It originally retailed for £1,250. Kate wore the stylish coat for Remembrance Sunday last year. 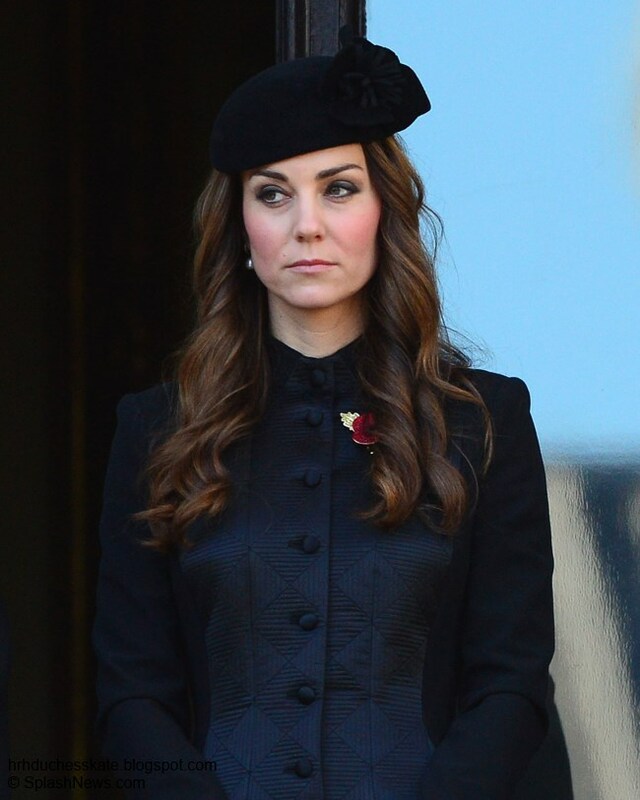 Kate completed the look with black pumps, black tights,black gloves a cream scarf and a sprig of rosemary. You can watch a clip from the service here. I loved this coat the first time Kate wore it and I love it now. It's very pretty and elegant. I really am not a fan of this coat. It reminds me of a strict Victorian school mistress. It is appropriate for the occasion Anon 0322. Hahaha omg really? I'm going to have to google some photos of a Victorian school mistress and compare the two. I like it, I think it's a lovely coat. OMG why pick at a coat when it was 5am when they attended this service. Why could you not say how great it was for them to get up very very early and go without anyone knowing they were going to be there. I bet that neither on one them got much sleep last night. Give her a break. I completely agree with Blair. Very special and says a lot to Kiwis and Aussies that they both did this. It is the most special event of the day. Hugely emotional watching the reutrned service men and women marching up and taking their places. I really don't mind what Kate wears to this but thought she was very appropriate. Most of us just fall out of bed, slap anything on and go. Its about being there and paying respect, not what is worn. The fact that they took the time to come out at dawn and participate in this ceremony is what sets them apart from the rest! Thank You so much for doing this blog too! I've been following you since the royal wedding (this is my first post too) and it has been fun to read, especially over these last few weeks that have been stressful for me. Maybe this will demonstrate to those who sneer about those "loafers" that Willuam and Kate both demonstrate the same kind of conscientious, caring comittment that has been the hallmark of The Queen's quiet, steady leadership every day of her long reign. That takes integrity - and they've got it. In total agreement, Jo! These young Royals have shown themselves to be excellent goodwill ambassadors and it looks like the monarchy is in very capable hands. They haven't put a foot wrong. Thank you, Charlotte, for giving us this wonderful forum. You deserve a rest too! Thank you Charlotte. I'm so pleased they attended. Lest we forget. So glad they were both able to attend. As always thank you to all Veterans and to those who have given their lives in service to their country. I hope we are able to see some of the ceremony. Speaks bucketloads that they should attend the Dawn service without fanfare in addition to the publicised later service. As said above, the Anzac service means so much to Australian and New Zealanders and W and K will have gained very much respect with this attendance. I would imagine their experience at this service will remain with them always. The various video feeds can't do it justice, I know, but the solemn elements of it and the first-light backdrop make it hauntingly beautiful to see from afar, even. What a wonderful, special place to be today. Everything about this is lovely. Thanks, Charlotte. 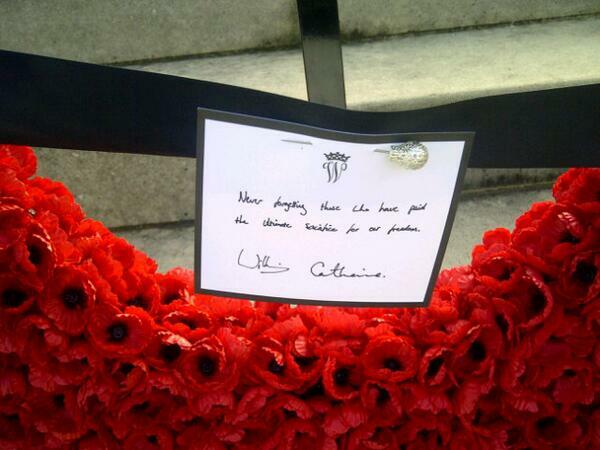 I feel so very pleased that they attended this mornings dawn service. It really means a lot. It must have been freezing down in Canberra this morning though! Kate looked lovely as always but its not really about what she wore today. Lest we forget. The Hornet F18 fighter jets from the flyover at the Anzac Day March in Canberra have just gone over our house. Just watching the service on the ABC and the Duke and Duchess at the Wall of Remembrance at the Australian War Memorial. Kate's wearing an elegant grey coat. The ABC commentary has just mentioned that the last time members of the royal family attended an Anzac Day service at the AWM was in 1970. We went to the Dawn Service at the AWM this morning - huge crowd of over 35000 people. Cold and overcast day here. This service is the most sombre and moving of all the Anzac Day ceremonies in Australia and kudos to William and Kate for arriving very quietly and without any fanfare or fuss. We had to get up at 3.30 a.m. to get there for the 5.30 a.m. start so can't imagine what time Kate had to get up to look so put together. But this was about respect and remembering and what Kate or William was wearing was totally irrelevant. All that mattered was that they were here. Also saw them yesterday and Kate was vivacious and engaged with people. They come across as a lovely couple. The green coat was clearly a courtesy to Australia by wearing one of our colours and it looked fine on her. Had a bit of a mod look and the wide belt really accentuated her waist. The coat also moved well when she walked. Have to say that we were focused on them as people and what they were doing rather than what she was wearing. The overall impression was that she's much prettier in real life, incredibly well groomed and elegant. She's also got a tall, lithe athletic build and looks very healthy. Thank you for sharing your impressions, Blue Wren. Thank you, Blue Wren! It's neat to hear how she comes across in person. I also think it is wonderful of them to have gone to this sunrise service with no fuss. A very touching gesture which speaks highly for them. The ceremony looks really moving and beautiful. I love that coat she wears every time! The brooch was not a poppy but an anemone based on one made for Russian Imperial family by Faberge. who she is as a person. Charlotte, thank you for weeks of enjoyment of your excellent coverage. Before I was even out of bed each morning, I reached for my laptop to see what you had posted. I must say you went over and above. Might I suggest that in order to take it easy for a bit, that you just ask for an open discussion of favorite outfit, etc? That could keep us engaged for days! Just a suggestion. BTW, I love the black coat! I absolutely love this coat and I'm glad she wore it again. It has an understated edge to it that is perfect for her age and figure. To be put simply, "kindness prevails" - what a lovely gesture of kindness and heartfelt goodwill from the couple. Yes, I too love this coat on her. Certain colors on her excel while others are not so good for her coloring. It was awesome of the couple to take the time to pay respects at such an early hour. Thank you as always to our Charlotte for her wonderful blogs!!! She has looked marvelous for each occasion throughout her tour. It has had to of been a grueling 3 weeks for them, especially with a baby in tow. I think she looked regal when she needed to and just like everyone else so often in an effort to make everyone feel like she and william more approachable. The monarchy has never been so well represented. Bravo Kate. Bravo William. I think you both did beautifully and looked wonderful over the last 3 weeks. Does anyone know what kind or brand of scarf that is? I find it very special that they attended. Thank you so very much for showing what that coat REALLY looks like!! I've never been able to see how it looks as it is so dark in photos snd the details get lost! !